In order to finish with the references, I’m running this on an Oracle Cloud compute instance (but you can run it anywhere). 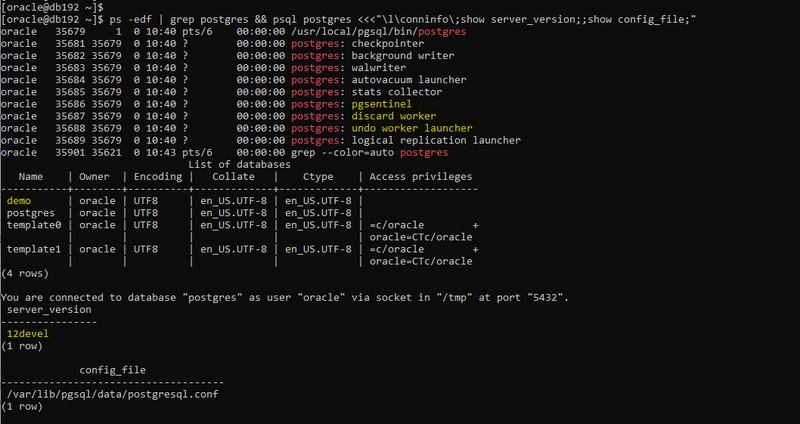 ps -edf | grep postgres && psql postgres <<<"\l\conninfo\;show server_version;"
psql postgres -c "create extension pgsentinel;"
psql postgres -c "create database demo;"
psql demo     -c "create extension pgsentinel;"
ps -edf | grep postgres && psql postgres <<<"\l\conninfo\;show server_version;show config_file;"
In the past I measured the redo journaling (WAL) by PostgreSQL (https://blog.dbi-services.com/full-page-logging-in-postgres-and-oracle/) because, coming from Oracle, I was surprised by the amount of redo generated by some small updates in PostgreSQL. This overhead is due to the combination of two weaknesses: full page logging and no in-place update. The second will be partially addressed by zHeap, so let’s do the same test. printf "%9s%1s %6s %7s %s\n","BYTES","","COUNT","AVG","process/file"
I strace the write calls (-e trace=write, pwrite64) without showing the data written (-s 0) when running the database server (pg_ctl start), tracing all child processes (-f) and showing the file names with the descriptor (-y). The awk keeps only the call, file, pid and bytes written to aggregate them. The pid is expanded with the process argv for better readability. The volume of undo is approximately the real volume of changes (I had 15MB of redo and 6MB of undo with same update on Oracle). But we still have an exaggerated volume of block changes (and with full-page logging). On this use case, which is quite common when we process data (call record, orders, …) and set only a flag or a date to mark them as processed, it seems that zHeap helps, but not a lot. But a real case would have many indexes on this table and updating in-place may reduce the overhead for non-updated columns. That’s for a future post.